You will earn 20,614 Reward Points. Earn 1 reward point for every 1 dollar spent. Convenient, externally operated lever drain. Completely self-draining stainless steel wash pump. Totally electro-mechanical; no solid state controls utilized. Heavy gauge construction for extra ruggedness and durability. Complete Right-to-Left and Left-to-Right convertibility in the field. Standard 8” vent cowls/splash shields on both wash and rinse ends of the machine. 248 racks per hour hi-temp sanitizing rinse. 234 racks per hour chemical sanitizing rinse. 0.94 gallons per rack hi-temp sanitizing rinse. 1.0 gallons per rack chemical sanitizing rinse. Stainless steel frame, legs, adjustable bullet feet, and front appearance panel are all standard. A long 18” wash section as well as 18” separation between wash and rinse produces superior results. 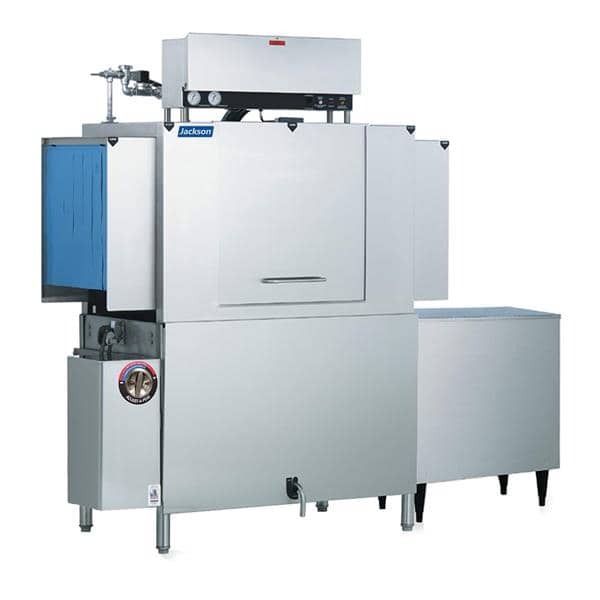 Standard 25” clearance allows owner operators the ability to wash large utensils, trays, and bun pans. Exclusive “Energy Guard” controls system operates wash and rinse sections only when a rack is being washed or rinsed. Exclusive Adjust-A-Peak feature (patented) allows the owner operator to manually adjust the speed of the conveyor system from 124 racks per hour all the way to maximum capacity of 248/234 racks per hour.